While all our branch managers are proud of the decks, verandahs, carports, patios and pergolas they design and build, every now and again a project comes along that is even more satisfying and fulfilling. 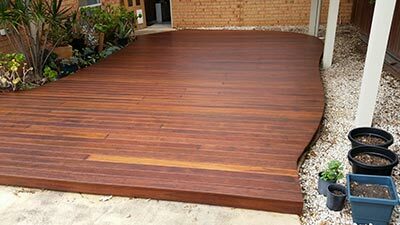 As in the case of this Melbourne decking and verandah project, completed by Jaan McKenzie and his team in Melbourne’s West. 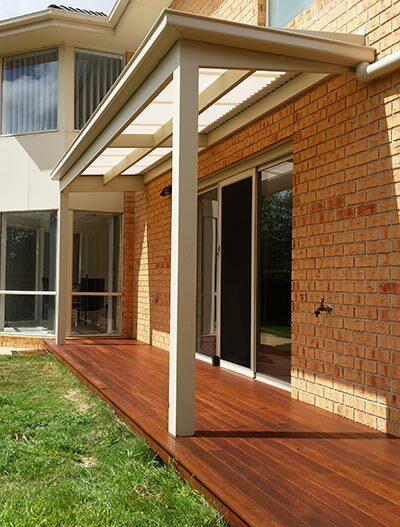 The project required two verandahs and a merbau deck, which featured a curved pattern on one end for added interest. A lot of thought also went into the design and choice of materials for the two verandahs, both of which featured heat-reduction polycarbonate roofing. This material lets the light in and also reduces heat incredibly well, thanks to heat reflecting technology. With the added protection of 99.9% UV blocking, the roofing will allow the clients to enjoy hot, sunny days entertaining and relaxing outside in comfort. One section of the large verandah has also been left open to allow rain to water the garden. 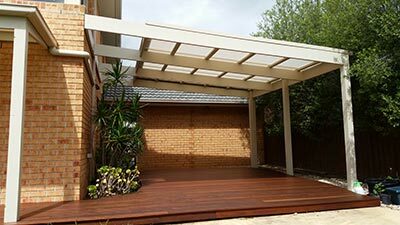 To complete the project and protect it, Jaan and his team also painted the verandah structure and oiled the Melbourne decking. All in all it’s a project that Jaan and his team is proud of. And, for the clients, it’s a project that they can be proud of and use regularly for many years to come.